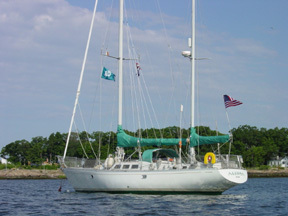 CoastalBoating.net is the one of the world's premier boating websites, attracting large numbers of unique visitors each month. These visitors are actively seeking out information about boating destinations, seamanship, nautical knowhow, products, and services. In fact, the number of page views per customer shows that when they come to visit, our viewers tend to stay a while, giving your ad multiple views and exposing your message for prolonged periods. Your ability to target an interested, affluent, and active community of boaters repeatedly when they are making decisions makes CoastalBoating.net an indispensable communications tool in your marketing mix. Whether you are marketing to the boaters, or to affluent coastal residents, then we offer you to be a part of a community they choose to visit, not one that is thrust upon them. The people visiting CoastalBoating.net are your customer base. There are several ways to connect to your customers on CoastalBoating.net. The site is organized into five main categories: Homeport, Cruising, Resources, Features and Events. Each category has subsections with hundreds of ideas for all boaters, all indexed and easily accessible. We update our content on a daily basis rather than waiting for a monthly edition like static print. This ensures our pick-up and listing high on the hierarchy of top search engines. We offer multiple options for advertising or sponsorship. You can place a banner ad or button on the home page or you can sponsor an entire section. Within a section you can sponsor individual pages with a zone ad or text link. We offer a number of different banner and button size/location options as shown in the table below. Each of our banner locations is exclusively available to only one advertiser per month; that means every visitor to the page will see your ad. Likewise, we offer only 10 button slots per page, with each large button option occupying two of these. Because of our commitment to our sponsors, we ask for a minimum 6-month advertising commitment. Please remember that all banner and button space allocations are done on a strict first come, first served basis. You can also place text links or ‘Zone ads’ in or beside articles that relate to your products or services. Custom opportunities such as topical content specifically tailored for a sponsor, co-branded content, or micro-sites will be considered on an individual request basis. Pick a content topic you know is near and dear to the hearts of your audience, and we'll build a package to attract significant qualified traffic. Your Ad, topical or co-branded content pages can be featured on our Facebook page. Zone ads may also be linked to your own social media page. Supply URL of page and text location you wish to link from. 120 wide x 240 pixels high max. All the ads are placed on our pages as images or text links, and are not affected by adblocking software. Ad units are run for the duration of a full calendar month (starting on the first of the month) for billing purposes. News tems are initially posted on the home page and are then transferred to an archive page as new items come in. The archived items remain accessible indefinitely at the discretion of the editors. Frequency discounts and multiple insertion specials available. Please contact us for details. All advertisements are subject to our editorial review. We reserve the absolute right to accept or reject any material at our sole discretion. Please contact us for instructions on submitting your material. If you place a banner or button ad, we'll add your company to our industry resource links page for free. There is no time limit for its inclusion here. Commit to a long-term relationship and get a customized package of benefits to suit your needs, which includes annual rates and discounts, special promotions, first option on new offerings and listing on a perpetual founding sponsor’s page. Get on board before it’s too late! is a division of Knowledge Clinic Ltd. Knowledge Clinic Ltd. retains the right to refuse any advertising and to discontinue running any ad deemed inappropriate. Fees for discontinued ads will be refunded on a pro-rated basis at the discretion of the company less 15% administrative costs.